The formal title of the drawing states that Robert Dawson supervised the surveyor. Dawson, one of the best surveyors and draughtsmen, was employed on the Ordnance Survey for over forty years, working also as an instructor. The scale of the drawing is noted and the area of the land recorded as 165.4742 square miles. A triangulation diagram appears on the reverse. 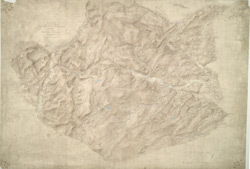 This enabled draughtsmen to plot the exact location of topographical features. Colour washes depicting relief are combined with numerical annotations ('spot heights') in black ink indicating the heights of hills. The draughtsman has also distinguished between the representation of coniferous and deciduous trees.